Mike McHugh, agency co-owner, is on a Dive FAM at Beaches Turks and Caicos. Today is our last day of diving. Johnny planned for our boat to go to West Caicos. Mike McHugh, co-owner of Dream Makers Vacation Services, is on a Dive FAM at Beaches Turks and Caicos. Today was the first day that I am diving with the Dive Group. This morning, we did the 2-Tank Dive. 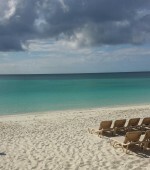 Mike McHugh, co-owner of Dream Makers Vacation Services is on a dive trip in Turks and Caicos. Every day but Sunday, they have a 2-tank morning dive. It is at 8:30 (8:15 check-in). They go to different dive sites, but usually it is to Northwest Point. The diving is great at Northwest Point. It is about a 40 min boat ride from the resort. You do a dive, have a surface interval of about an hour, and another dive, then head back. You are usually back at the resort by 1pm. I, Mike McHugh, co-owner of Dream Makers Vacation Services am experiencing a dive FAM at Beaches Turks and Caicos. I did two dives today. On Sunday, they do not do any 2-tank dives, just a morning and afternoon 1-tank dive. Both are in Grace Bay. Depending where they go in Grace Bay, the boat ride is only 5-10 mins. Michael McHugh, co-owner of Dream Makers Vacation Services arrives at Beaches Turks & Caicos for a Dive FAM. Read on to hear about his first day. Co-Owner Mike McHugh and his son, Ardan wrap up their last day at Beaches Turks & Caicos. Mike & Ardan enjoy their last full day at Beaches Turks & Caicos with good food, fun activities and relaxation.